3i infotech Walk-in interview for fresher’s on 8th to 15th October 2016 for Associate at Noida. Any Graduate candidates can attend the walk-in interview for the Associate Role. Grab the great job opportunity to kick start your career as a fresher. Before attend the walk-in interview, Candidates should go through the Job Profile, Qualification, Job Description etc., clearly given below. 3i infotech Walk-In Any Graduate freshers 2017 for Associate at Noida. 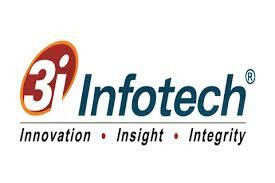 Candidates who have completed Any Graduate can apply for this job from 3i infotech . Candidates can Get the Associate Post details such as Post name, Number of vacancy, Qualification, Job Description, Candidate Profile, Company Profile and etc., from the table given below. Venue: 3i Infotech Ltd. B- 56, Near Hyundai Work Shop, Sector 57, Noida Uttar Pradesh 201301.